As expected, the submissions for Free Featured Fiction are coming in a bit more slowly than for the "Know Your Hunt to Read Authors." Totally fine; a lot of folks still get a bit nervous about giving their fiction away for free. Fortunately, I've lost just about all such hangups I once had. 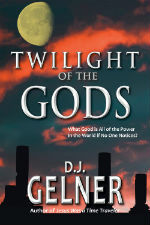 To wit: I was originally going to release Twilight of the Gods under a pen name. 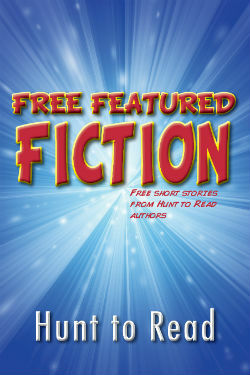 However, when we started this feature, I figured why not just come clean and serialize it in "Free Featured Fiction," for all of our readers to enjoy. So without any further delay, here are the first two chapters of Twilight of the Gods. Enjoy! To any mere mortal, the church bells from the foot of the mountain would have seemed little more than a whisper beckoning from civilization amidst the sharp, cutting breeze atop the peak. “Will you shut up! ?” Zeus snarled. He unsheathed a cackling, white hot bolt of focused electricity and launched it at the village at the bottom of the gods’ sanctuary. Thunder scarred the otherwise idyllic Greek Sunday. It was followed by a driving rainstorm that sent villagers ducking for cover, though much to Zeus’s chagrin, many sought refuge in the large church in the center of town. The erstwhile leader of the gods curled his lip into a scowl. A long, cool metal rod came to rest on his shoulder; the king of the gods shivered. Zeus shook his head. His gaze turned to the church, candlelight peeking out through stained glass as organ notes and songs danced through the sharp Olympian air. Zeus collected the end of the rope that held his toga together; it did seem to be a bit much. Not to mention that the fabric of his garment hung slack over his diminishing frame. “Though good Apollo always seemed to get the most lavish gifts and finest food and drink these mortals had to offer, we used to do pretty well for ourselves,” Poseidon clasped his brother’s bony shoulder. “Perhaps!” Zeus thundered. Another low rumble from the sky punctuated his dark proclamation as he turned away from Poseidon, “We have coddled these humans for far too long. Thousands of years now, each one spent ‘wishing’ and ‘hoping’ that they’ll finally come to their senses and return to proper worship. “But now, they scatter far from Olympus, away from watchful eyes of the Pantheon. They worship other gods, wrathful gods, as well as idols both material and divine. “Don’t forget empty mouths!” Poseidon wagged a finger at his brother. He took several angry steps toward Poseidon, who raised his trident over his head, ready to fling it at his brother with all of the might his weary frame could muster. As Zeus reached back to scorch his brother with another electric projectile, both men stopped in their tracks. A silver arrow split the distance between the two gods and lodged itself into the face of the crag. The brothers looked at each other, and then toward the source of the commotion. Poseidon couldn’t stifle several guffaws. Artemis released the bowstring and sent another silver projectile flying toward her father. This time, it missed his groin by mere inches. Zeus allowed himself a gulp. Artemis strung another arrow onto her bow. Zeus’s face dropped. He flung himself against the rock wall, arms spread out wide. Zeus stroked his wildly-stubbled chin. Had he once enjoyed such power? Such dominion over god and man alike? Perhaps more importantly, where had it all gone wrong? He took a tentative step toward his daughter, her eyes still steeled and focused, bow ready to be extended and threaded based on his next utterance. Artemis’s lips curled into a smirk. Artemis’s eyes narrowed, the huntress within her emerging to stalk her prey. The Pantheon atop Mount Olympus sat nearly ruined in the muted light of the overcast sky. Once-impressive pillars lay broken, cleaved in half by the erosion of the elements. Tall weeds sprouted from the cracks in the weathered, blemished marble. The gods that manned their usual stations despite their harrowing surroundings made the haunting scene all the more pathetic. Formerly well-defined stomach muscles on males and females alike were either hidden by massive layers of fat, or sunken into hollow ribcages. Once lustrous hair had gone ragged, disheveled, and straggly, and covered pale, ashen skin. It was the first time the twelve gods of Olympus had been called to order in years. Many of them had to be wrenched away from their usual pastime of watching the mortals squabble over some dreadful war or another, yet when called, they still honored the pact that they had all taken after defeating the Titans ages ago. Old friends and relatives made small talk about the past thousand-or-so years with all of the joy of describing recent dental work. Only one overweight, disheveled figure howled with glee at every piece of information, as if each tidbit was the funniest joke he had ever heard. He stumbled about with a chalice in his hand, spilling its contents all over the dingy marble floor. A thunderbolt cracked and sizzled across the sky, and caused even the drunkard to come to a stop, albeit a swaying one. A round of mock cheers went up from the assembled deities, which caused Poseidon to chuckle. Zeus purposely didn’t look toward Hera upon mentioning this fact; he had received enough earfuls about his dalliances with human women through the years to last him fifty eternities. A thin woman with gaunt, high cheekbones twirled a raggedy curl in her finger, “Speak for yourself, Zeus—some of us are still desired by the mortals,” she turned her flawless nose upward, even as she strained to hide yellowed teeth. Hera again glared at her husband. He looked around the room, slowly making sure to catch every god or goddess’s eye in turn with a stern, measured glare. “Oh, is that all? Is that it? Make them believe? I’m sure they’ll be lining up, roasting suckling pigs alive in no time,” a younger, lean god rolled his eyes. “Pay heed, Hermes,” Zeus shot the herald daggers. The elder gods exchanged vacant glances. “Fail to sacrifice a goat in honor of dear uncle Poseidon before setting to sea? Waves will crash down upon you, scuttling your ship to splinters! Pestilence ravaging your village? If you do not pray to brother Apollo, good luck healing your sick. “At one time, we gave mortals reason to fear the gods!” She deftly moved over to the drunkard teetering on his perch next to her and caressed his arm, “But as good Dionysus can attest, we have grown soft. We worry not about them, but have squabbled with one another to the point where we want nothing to do with one another, content to swig wine crafted from common weeds and watch human exploits all day. Grumbles resonated from around the Pantheon, with the exception of Dionysus, who nodded profusely before punctuating the statement with a loud belch. Artemis’s eyes grew fiery and bothered, “I said use them, not practice them! Such words bring similar distaste to my lips as yours, noble Hermes. They are cold words, distant words, mortal words, used to describe phenomena of which they cannot explain, to attempt to break them into palatable words to be delivered to the masses. Most of the deities looked at each other in bemused wonderment. Poseidon stroked his thin beard in contemplation, “My child, it might just work,” he beamed. He raised the trident to the sky, trying in vain to find sunlight through the thick ceiling of clouds that dampened the sky. A solitary, thin ray of sunlight poked through the cover. Then another. Within short order, the once-great god willed more of the shafts of light onto the trident, which now glowed with hot, gold energy in the light of the day. Even Apollo was impressed. The younger god leapt to his feet, his thin frame still more than capable of controlling the heavens, funneling more energy into his uncle’s implement of destruction. Zeus looked at his daughter and sighed. It was not a sign of resignation, but rather one of pride in the kind of strong goddess she had become, even absent all of the adulation and gifts that they had once craved. He nodded as a smirk crept over his own countenance for what seemed like the first time in centuries. “Very well. Fair Artemis, take charge in my stead while I am gone,” Zeus’s proclamation caused surprisingly muted grumbles among the other deities. For her part, Artemis did well to conceal her smirk. Half-hearted cheers born more of weakness than indifference echoed around the ruined pillars and columns of the mountaintop, and echoed through the vast emptiness, a mere whisper on the winds to accompany the two most powerful beings on earth down the mountainside.